Our Snapdragon-rocking Xiaomi Redmi Note 3 unit runs on a Global MIUI 8 beta, which is built on top of an Android 5.1.1 Lollipop core. The MIUI 8 brings its own take at the interface and improves on its performance. According to Xiaomi's changelog, MIUI 8 comes with better text rendering, enhanced Power saving mode, new Notes app and Enhanced video editing tools. As usual Xiaomi's customizations run very deep and replace everything including all Google services. In fact, the Mi phones sold in China don't have access to Google's services and those need to be sideloaded one way or the other (some resellers may even do that for you). The models sold officially on markets outside of China come with a preloaded Play Store app. The lockscreen is unchanged from MIUI7 and has a clock in the top left corner - gone are the lockscreen widgets. To unlock the phone you swipe upwards and if you want a quick access to the camera - just swipe from the right side. Fingerprint unlock is available and is handled in our favorite way - you just put your finger on the sensor at the back and the Redmi Note 3 unlocks immediately. The scanner is always on and you can unlock even when the screen is asleep. MIUI v.8 has five default themes - MIUI, High Life, Pink Blush, Rose and Ocean Breeze. They've been handpicked by the MIUI team and you can choose your interface look right from the start, but you can always download new themes from the Mi Store. The notification area has two semi-transparent tabs - the first one hosts all notifications, while the second one (swipe left to access) offers customizable quick toggles and a Settings shortcut. 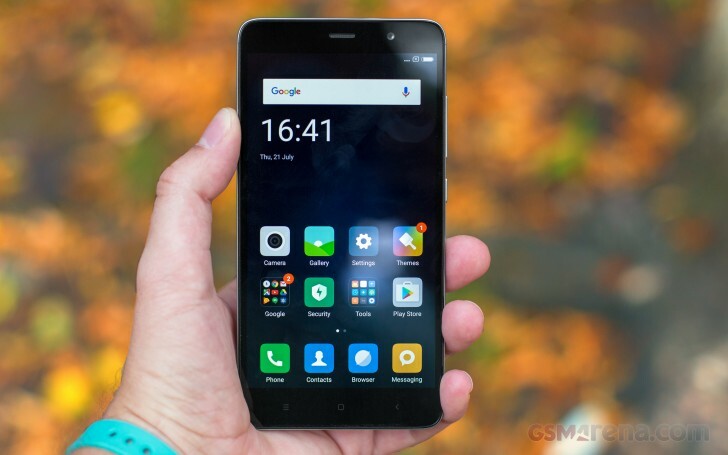 Xiaomi provides its own cloud service for content syncing between devices. Each Mi Cloud account is granted 5GB of free storage. You can use it to backup contacts, messages, your entire gallery, calls log, notes, settings, voice recordings, Browser content (history, tabs, webapp data) and your music library. The Do Not Disturb mode has been enhanced too - it supports better customization and scheduling options. We did get our review unit with pre-installed Google Play Store plus Google sync for app data, contacts, and browser data but perhaps they've been sideloaded by the reseller providing this review unit. Of course, you can sideload them yourself one way or the other if they don't come pre-installed on your unit. And once you have those, you can easily download all other Google apps such as Google Now straight from the Play Store.